Ants can become a problem for your Athens home all year long. The amount of space they require to enter your home is minimal. These insects will also create yard and landscaping problems for your property. Most species are only a nuisance, but fire ants can cause a painful, itchy lump that can become very red and swollen in 1-2 days due to their sting. Most prefer to live outside until the weather becomes too cold, dry, or wet for them. The problem with ants is that once they find a food source, they will continue returning to it. If their foraging activities take them into your home and they find what they need, then you can find a swarm of ants inside in a short amount of time. Thousands of them can sometimes appear overnight. Getting rid of them can be a challenge since the foods we eat are also want the ants will forage. Our team will first identify the species that are invading your home and then search for each food sources that could tempt them to keep coming inside. Then our pest control experts will provide a customized solution for your Athens home. 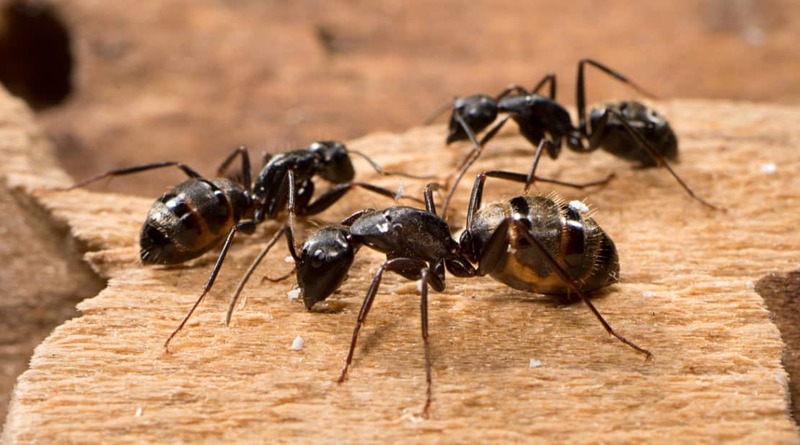 What About Carpenter Ants in My Athens Home? Carpenter ants are enormous insects that build nests inside of wood structures. They use their mandibles to hollow out sections of trees, seasoned firewood, or the exterior of your property. Swarms begin to appear in April and May here in Athens. They require a water source to survive, so our team will look to seal openings, remove resources, and recommend removing building materials and other habitat items away from the home. Do Ants Build Nests Inside in Athens, GA? One of the reasons that ants can be so challenging to eliminate from a home is because they can set up their colony inside of the house’s structure. Their pheromone trails can lead you toward the various openings that they might use to travel between the exterior and interior of your structure. Our team will work with you to identify places where caulking and sealing can eliminate passage from the outside to the inside of your home. We will then use safe products to remove their trail pheromone to prevent ongoing infestations. If a colony establishes itself inside, then we will work to remove that as well. If you suspect ants are in your home, then contact our team today. We will treat your Athens house safely and quickly to ensure that this pest doesn’t get the best of you.